I’m a big fan of A Book Apart. I've been reading their brief books on design, writing, and code since I bought a 3-pack of their first titles in 2012. Throughout the years, I’ve picked up many A Book Apart books, and they have all been incredibly insightful and useful. Their most recent title, Erika Hall’s Conversational Design, is no exception. I was lucky enough to attend Hall’s talk “Design with Words” at the 2016 Talkabot conference where she introduced many of the ideas she explores in the book. That talk and Conversational Design wonderfully encapsulate the opportunity a conversational design framework offers interface designers. She covers many of the concepts I discuss regularly with other conversational designers. Additionally, Hall lends fresh, new perspectives about how to further refine one’s process and approach conversational design. Conversational Design illuminates how conversational design can influence the strategy, research, and design of every type of interface we build. Hall weaves in history, philosophy, and psychology to reveal how conversation is the basis for interaction and an effective design framework. As Hall examines the ways humans converse, such as texting and verbal conversation, she describes the notion of orality – the human tendency to share concepts through language. Hall recounts our social history as an oral culture, before literacy and writing made us more individualistic. I find these historical points especially interesting as a designer in the midst of a technological revolution that upends our previous notions of orality and literacy. The conversational design approach suits this new technological landscape well because it centers around how humans have always exchanged information and ideas – via conversation. Conversational design melds the practice of human conversation with current technological advancements like social media and artificial intelligence. Conversational exchanges comprise a large part of internet culture and support the ideals of a more connected, decentralized society. Conversational Design also delves into the collaborative principles of conversation – Grice's Maxims and how those principles translate to interface design. Hall helps designers understand how to apply those principles in practice. She outlines how we can handle the most important moments in interaction: introduction, orientation, action, and guidance then stresses the importance of personality as a unifier of all these principles. I’m especially interested in incorporating the personality development and branding exercises she describes into my own branding process. Hall does not shy away from pointing out some of the shortcomings of design and the tech industry as a whole. She lays out concepts that drive better design processes, such as collaboration amongst teams as well as with users. Teams should collaborate through meaningful conversations rather than organization divisions and hierarchy. In kind, those teams should have conversations with users through research, prototyping, and testing. She provides clear, actionable tips for designers to implement those processes in their organization. 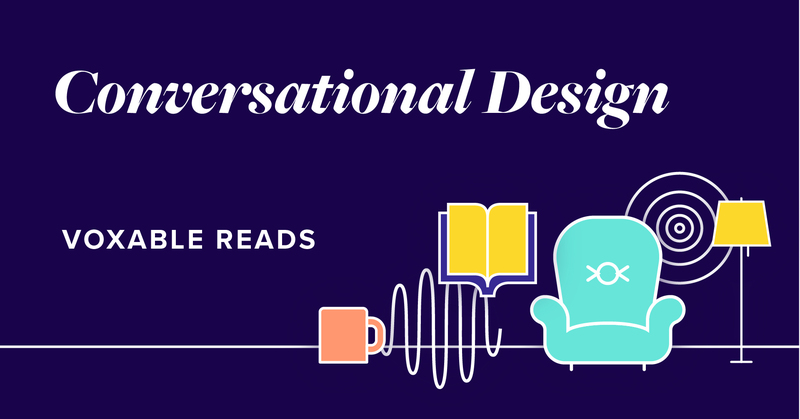 Above all, Conversational Design is a thought-provoking read for any designer who is interested in learning how to research, write, and design an interface better. I will keep this book at my desk to refer back to the slew of highlights, notes, and exercises it contains.